Grant Morrison has been teasing it for years, but the epic Multiversity storyline will finally be hitting comic shop shelves later this summer. 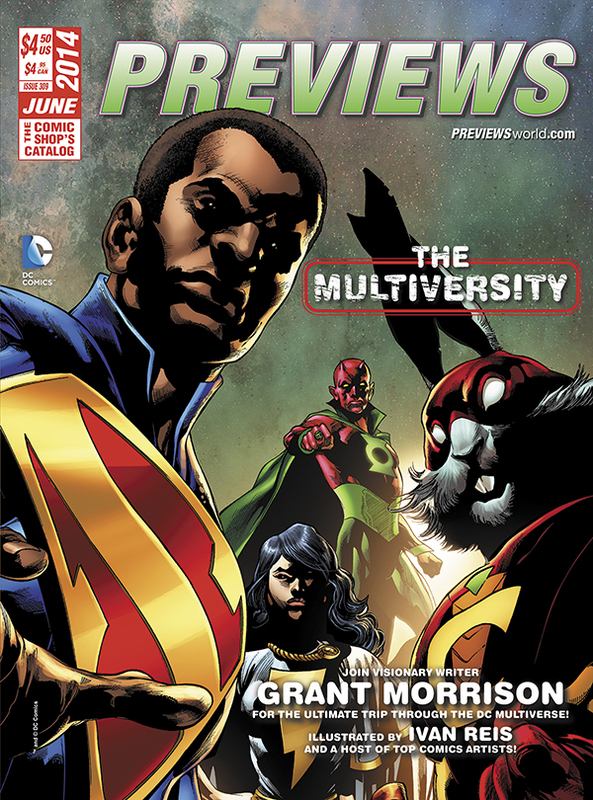 If you needed more proof, DC Comics’ The Multiversity graces the coveted front cover of the June edition of PREVIEWS, Diamond Comic Distributors’ monthly catalog of items it ships to stores, which will be available next week. First envisioned in 2009, Morrison’s take on alternate universe versions of the Justice League will finally be told in a 10-issue series debuting in August. Though each issue of the series will take place in a different part of the Multiverse, it looks like the Superman of Earth-23 — who first appeared in Final Crisis #7 before having an Action Comics issue dedicated to him in 2012 — will be one of the breakout characters, as he is prominently featured on the cover (along with Captain Carrot, no less). Take a peek at the PREVIEWS cover after the jump. Last month, Newsarama had a great rundown of The Multiversity culling together hints and teases from various articles and interviews over the years. Here’s what they had to say about Earth-23 and President Calvin Ellis (a.k.a. “Black Superman”). The Superman from Earth-23 has dark skin, hailing from an island on Krypton, which essentially makes him a black version of the character. In a nod to U.S. President Barack Obama, this Earth-23 Superman has a secret identity on Earth of Calvin Ellis, president of the United States. The character first appeared in Final Crisis #7, but he got his own post-New 52 reboot adventures in Action Comics. We’ll find out in August. It’s Grant so I trust that this will be good! Previous Entry GameCenter CX: Kachou On!